A few weeks back, I talked about how to avoid burning polymer clay. Several of you shared great comments with your own tips. And as part of that, folks made several suggestions for baking surfaces. I thought I'd do a separate post here talking about some of my favorite baking surfaces, as well as highlighting some of your suggestions. Even Heating: One of the great things about pizza stones is that they heat food (or polymer clay) evenly. Nice Surface: Pizza stones are naturally non-stick once they're broken in. This is also the surface where my corn starch trick works best (corn starch may pool on slicker ceramic tiles). Keep in mind that these stones do have a little texture, though, so you may want to add a layer of parchment paper if you don't want your work to have a rough back. toaster oven. This makes it perfect for baking larger or multiple items. While I love my pizza stone, I'm always a little worried about breaking it. So for guild day, I take little 4" ceramic tiles. Less than 50 cents each at Home Depot or Lowes, they're a nice inexpensive option that can double as a work surface. I keep 4-5 on hand for when I'm doing lots of baking at once. Another good choice (and I think the first surface I ever baked on) is the glass from a picture frame. These are pretty cheap — even cheaper at garage sales or thrift stores — and come in a variety of sizes. They're also nice as a work surface, especially if you want to see through to a grid or design below the glass. The downside is that they are fairly fragile and can have sharp edges, so you have to be extra careful using them. I used to use the flimsy aluminum bread loaf pans. While they're cheap, they tend to distort. This can be bad if you're trying to bake a flat sheet in the bottom. But if you're not concerned about that, you might give it a try. They are nice to use with polyfill: just put a layer in the bottom of the loaf pan. Another surface that seems to work better for other folks than for me is card stock. For some reason, my card stock seems to curl in the oven — and curls the clay with it! One of my guild members suggested that the card stock I'm using may have some sort of surface finish that's causing this. It's possible that some brands work better than others. In the comments of my post on burning clay, Jeanne Rhea mentioned that baking on metal trays (such as cookie sheets) made burning more likely for her. Instead, she recommends using ceramic tiles with a layer of manila folder weight paper. JuLi recommends baking in an upside-down pyrex-form chicken roaster. Karen T. suggests using an old microwave oven glass tray. This heavy glass sounds much sturdier than the picture frame inserts I've used! So... what's your favorite baking surface? Suggestions for polymer clay baking surfaces... some that work well and some that don't! I use a 6" x 8" ceramic tile that fits my toaster oven quite nicely. I also use a piece of office paper or parchment on top of that. Never had a problem with using cardstock, though I don't think mine has a coating on it, so that could be it. I like your idea for using a pizza stone. I'll have to watch for one of those! Thanks for the comment, Cindy. I recently tried baking sandwich-style: a ceramic tile on bottom, then my clay, then office paper, then an upside down ceramic tile. This was based on a suggestion from the Mixed Media Mosaics book, and it worked well for me. 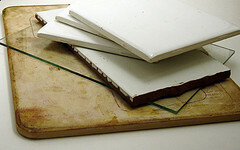 The top tile keeps everything nice and flat, which is important for something like mosaic tiles. There's always something new to learn! Terra cotta saucers (for under planting pots) are inexpensive (especially in the fall), come in all different sizes at Wal-Mart, and I've gotten good results with them (haven't tried using them without placing parchment or waxed paper under the beads yet though). Very even heat! (Personally, I wait for the oven to cool down before removing). To avoid leaving polymer residue in an oven, one may serve as a "lid" for another. What a clever idea, Karen! Sounds like it would have a lot of the same benefits as my favorite pizza stone, but it's cheaper and easier to find. Thanks for sharing!